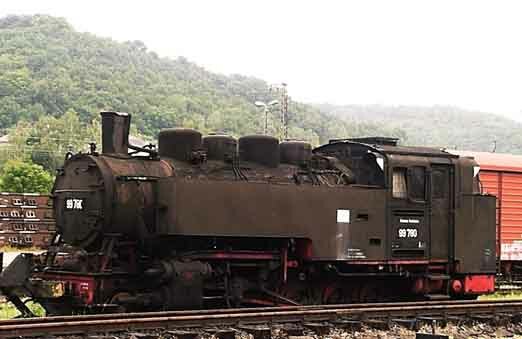 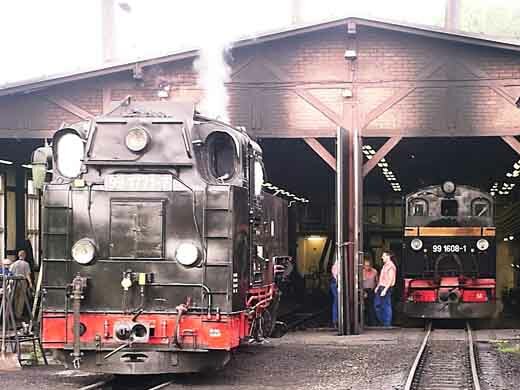 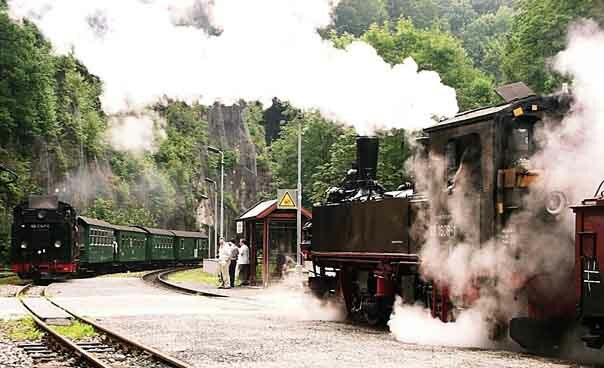 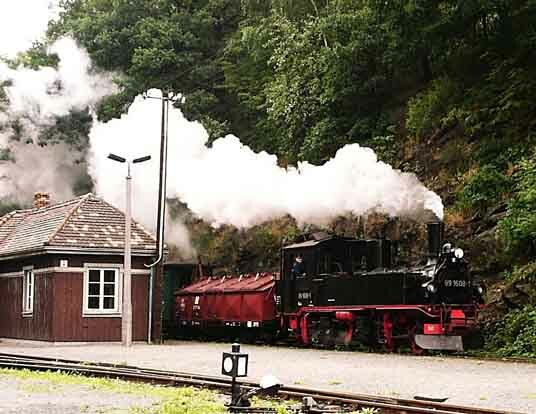 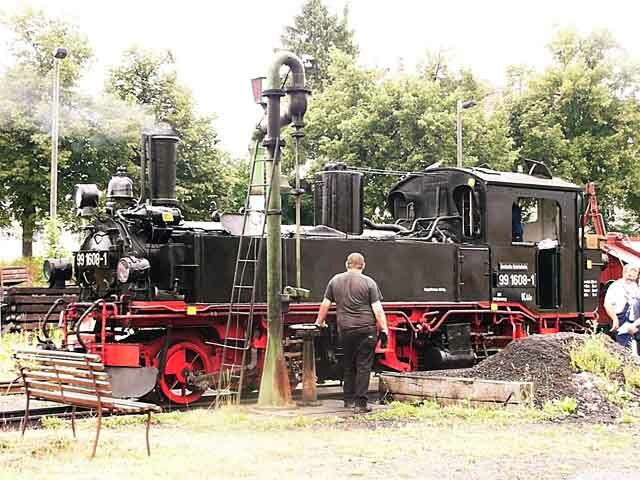 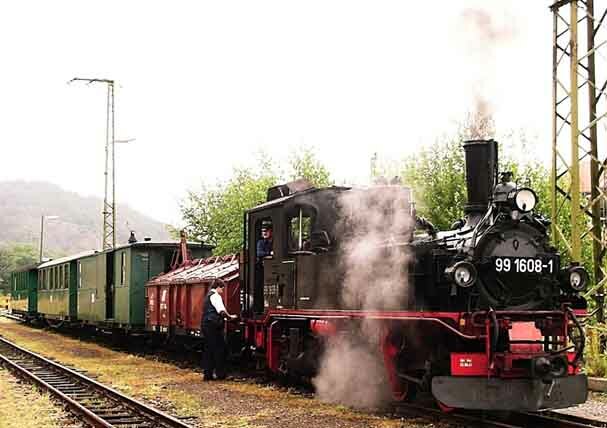 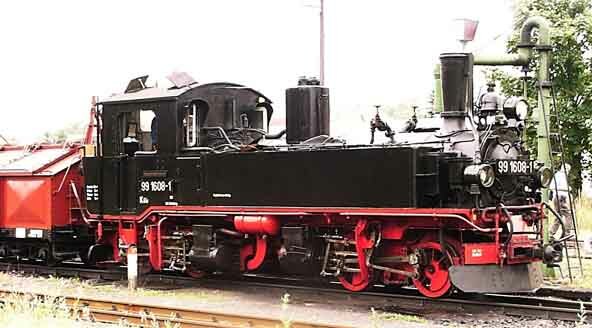 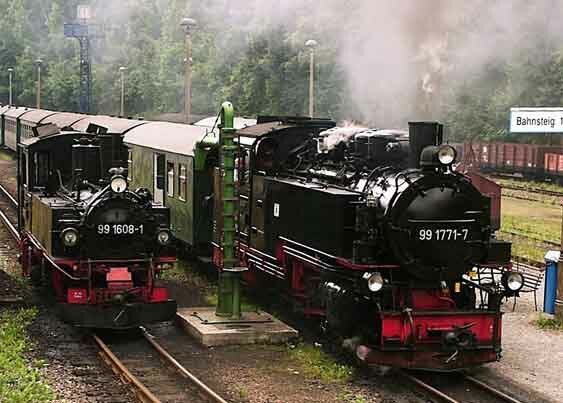 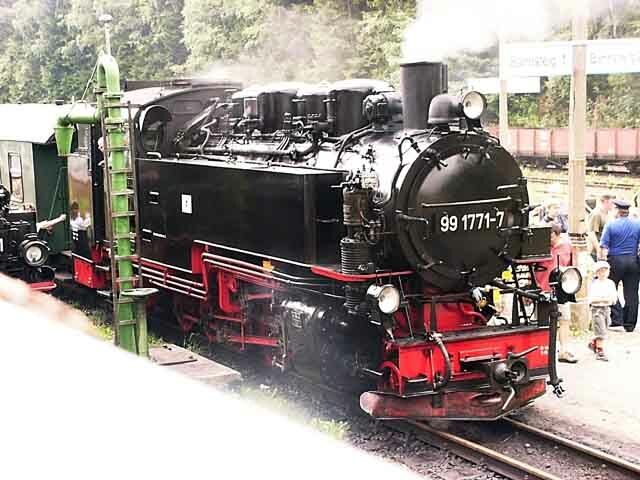 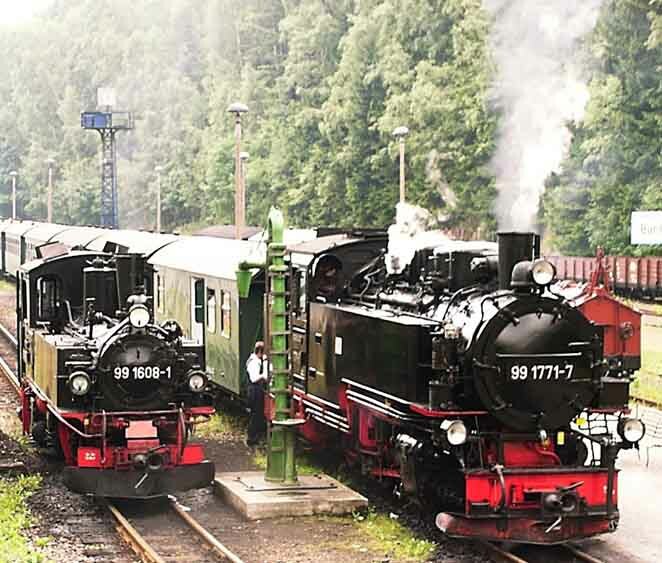 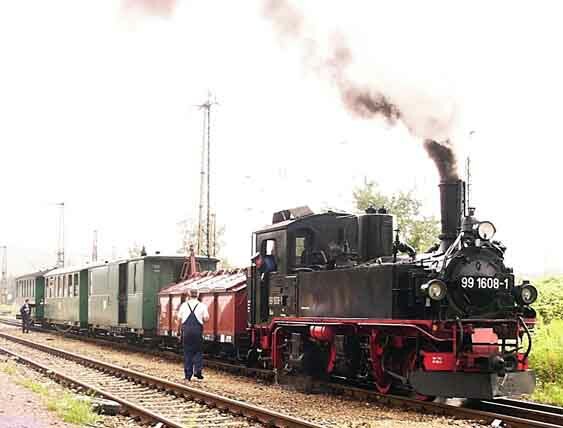 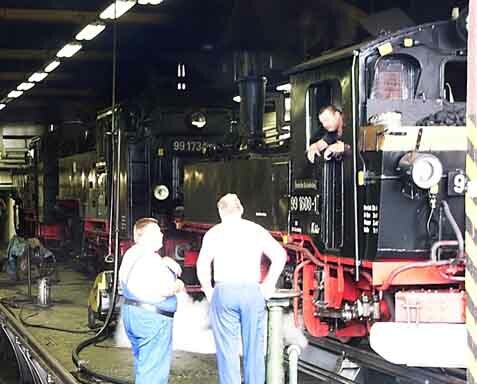 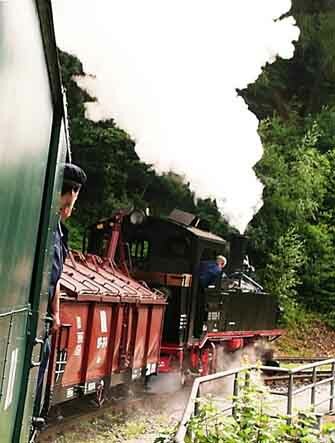 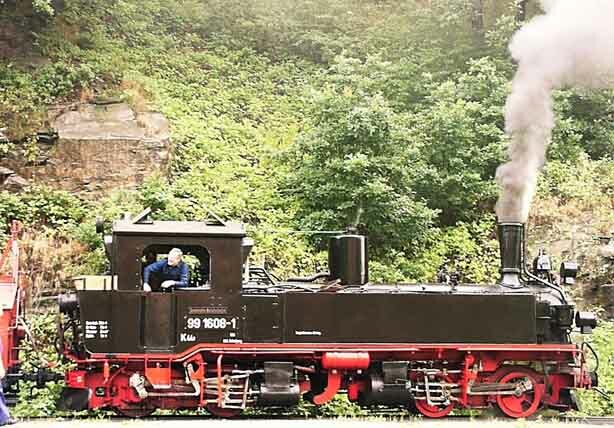 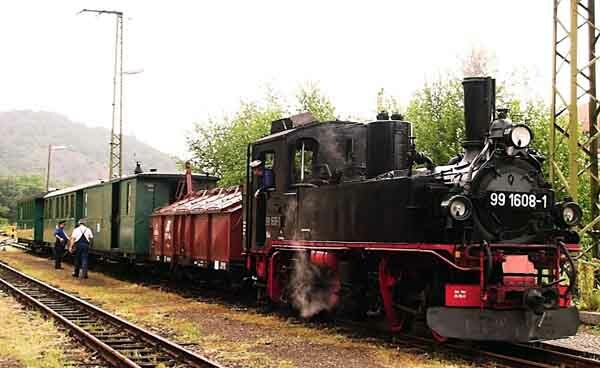 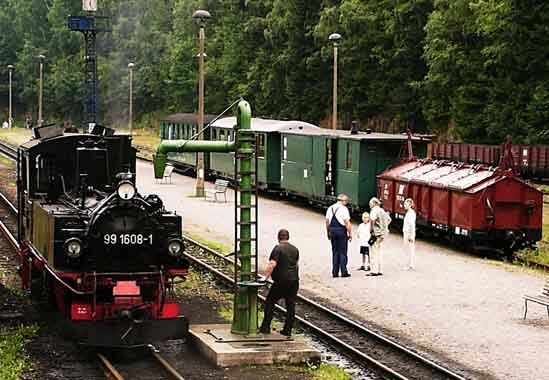 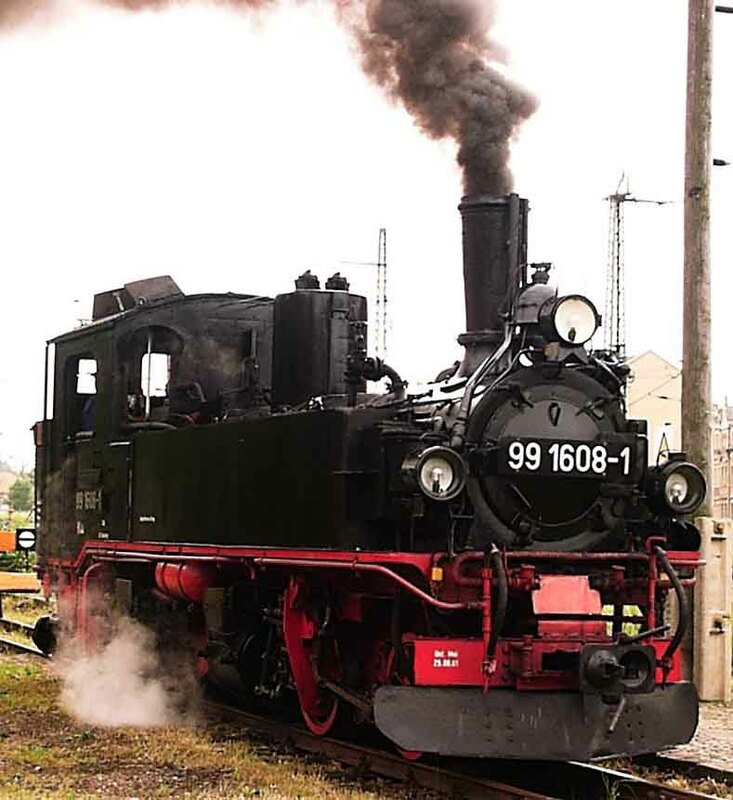 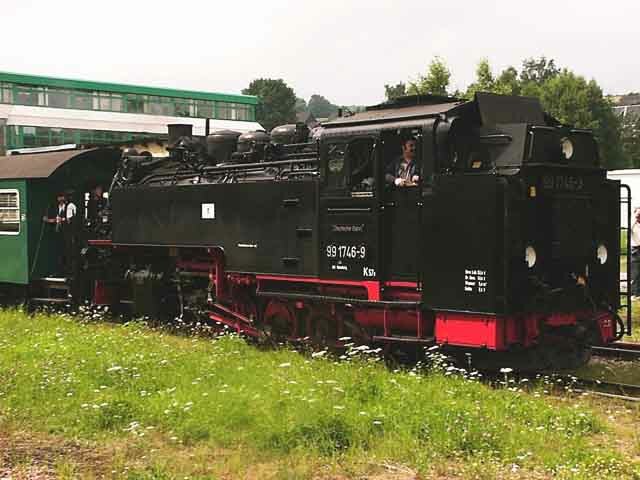 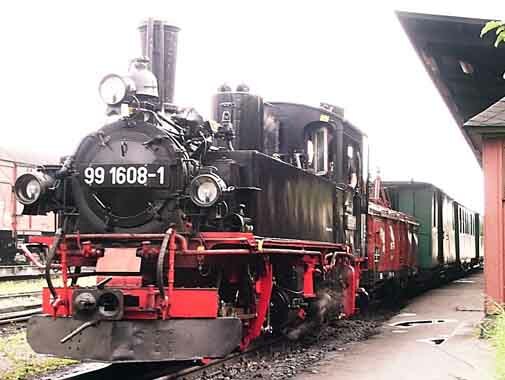 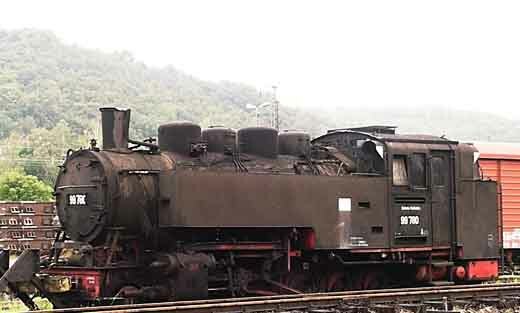 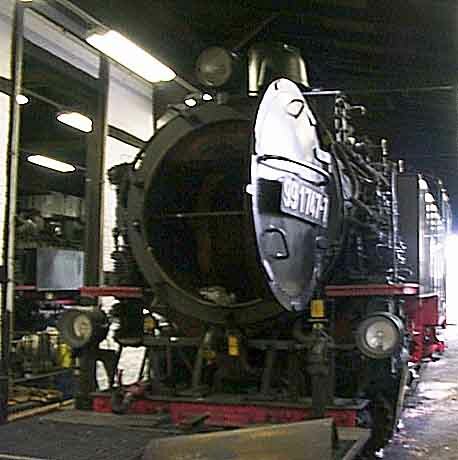 We arrived at Freital Potschappel at 8.45 to find Meyer 0-4-4-0T 99 1608-1 standing right by the entrance. 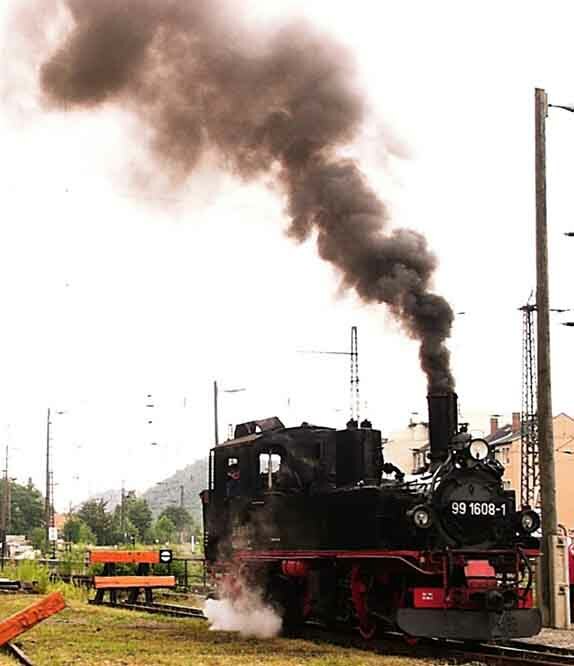 After a few minutes it moved off to couple up to our train. 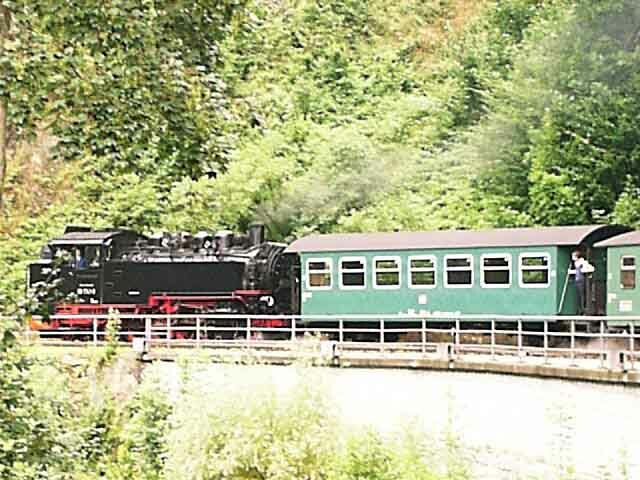 We then travelled a short way along the dual gauge track, complete with overhead wires, before making the first photostop. 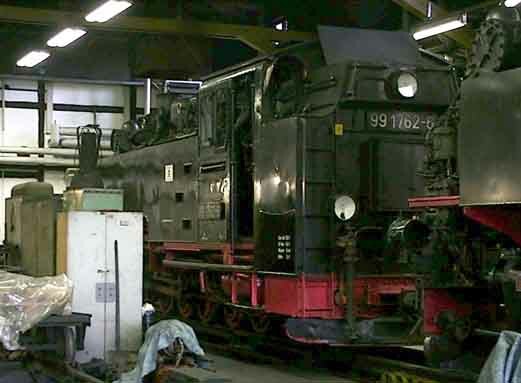 99 1747-7, 99 1762-6 and 99 1734-5 were all inside the shed receiving attention. 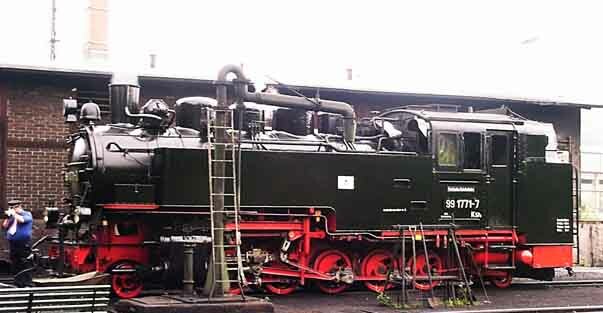 As the Meyer went back to our train I just had time to get some shots of stored 99 780. 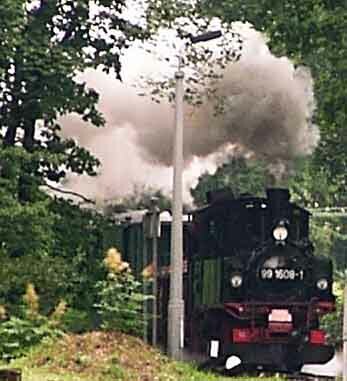 The next stop was Rabenau, the first shot showing our train approaching, before we got off while it did a second run into the station. 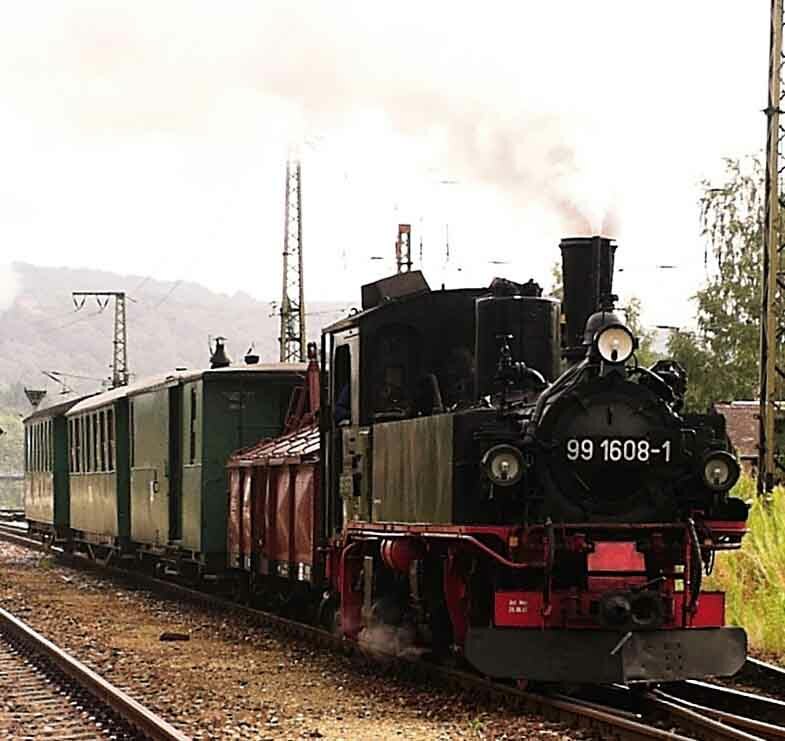 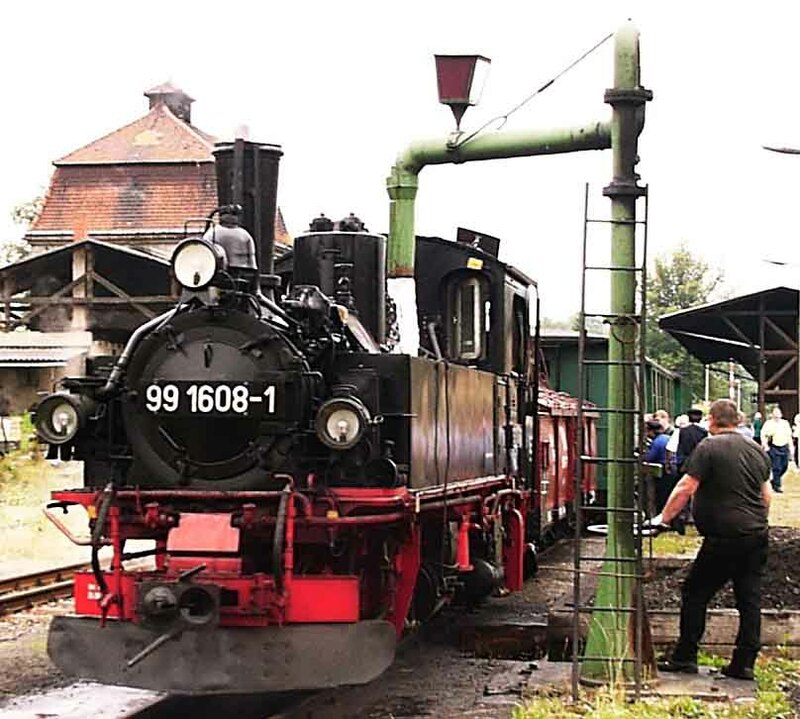 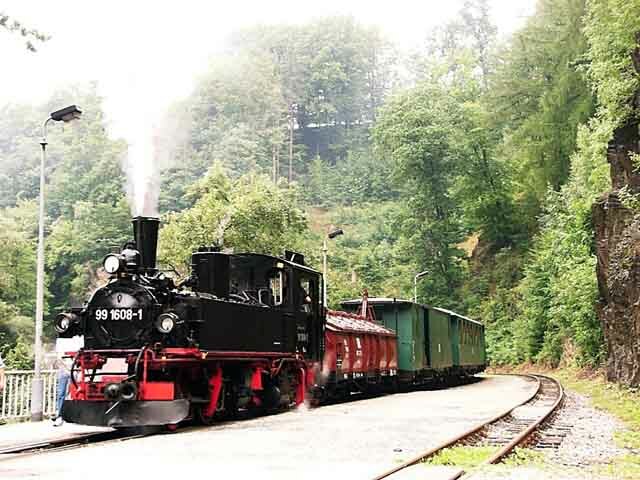 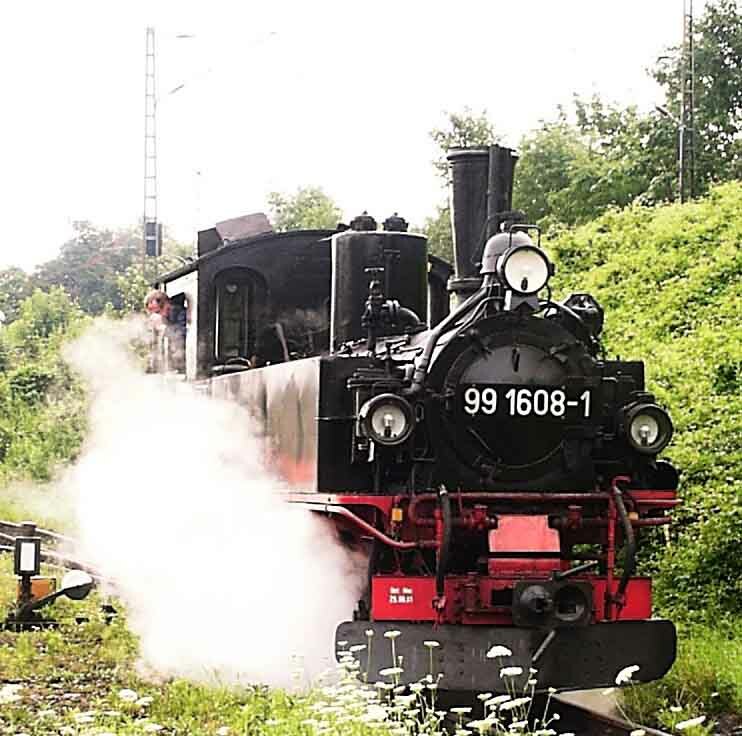 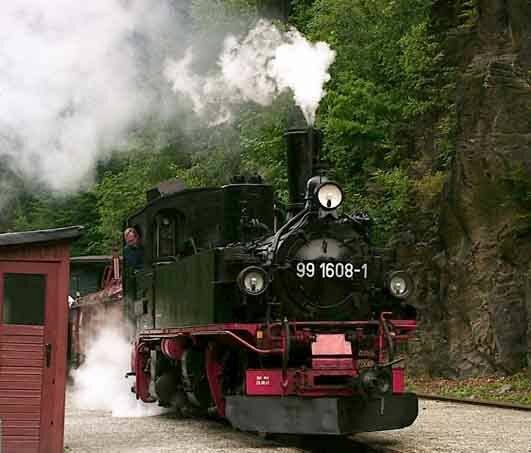 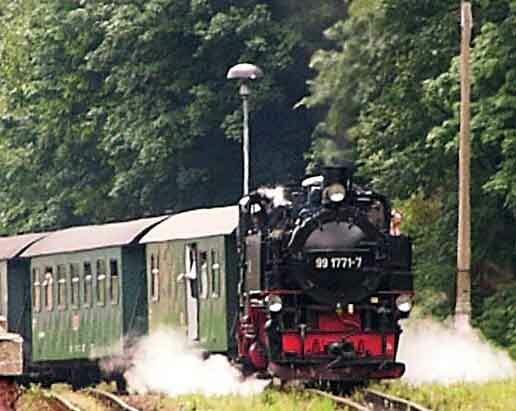 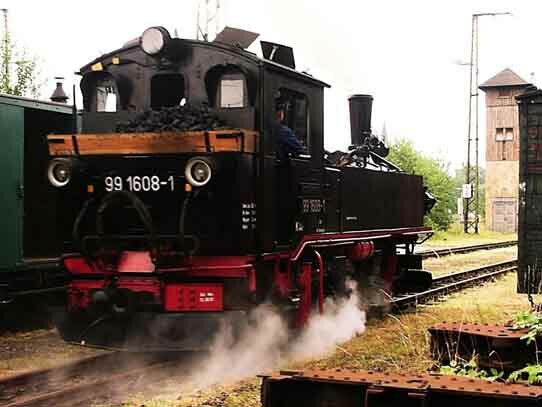 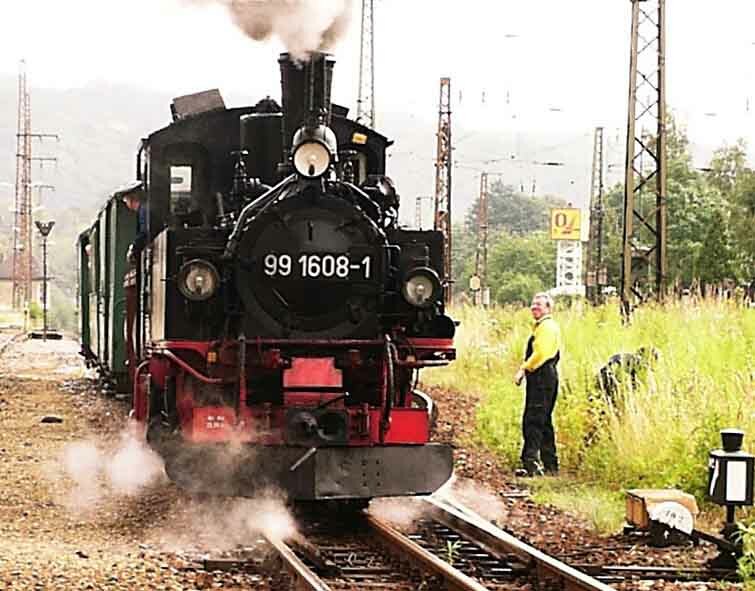 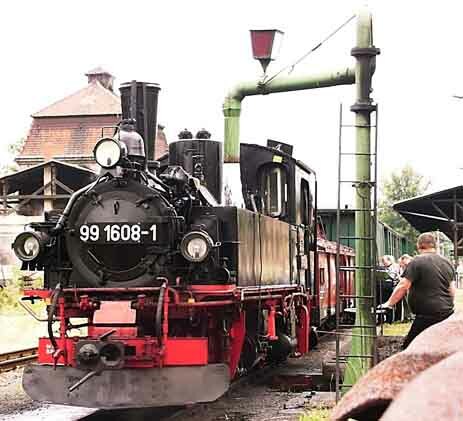 After this there was a short wait for a Kurort Kipsdorf to Freital-Hainsberg train hauled by 0-10-0T 99 1741-0. 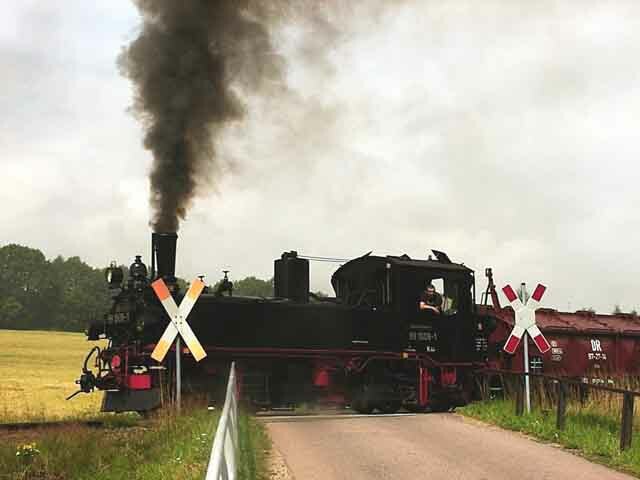 Another stop was made for a runpast at km 5.5, between Rabenau and Seifersdorf, after which the train reversed back to collect us. 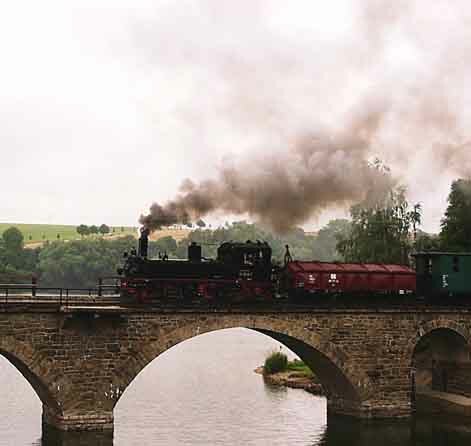 Near Malter we had another runpast over the Windbrucke. 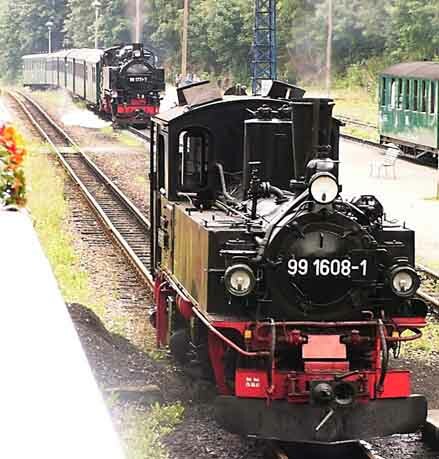 A stop for water was made at Dippoldiswalde. 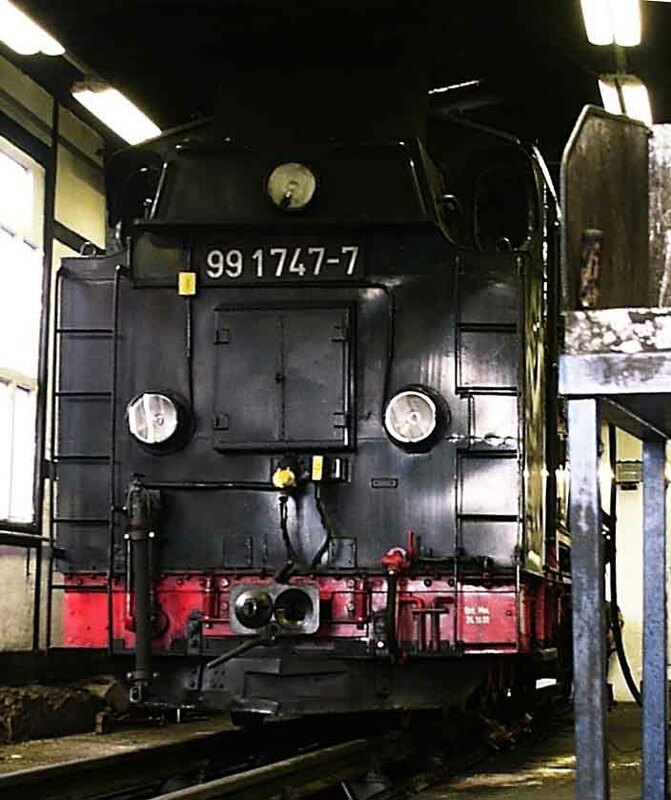 Less than a month after these photographs were taken the line was severely damaged by the flooding in eastern Europe and 99 1747-7 is marooned here with its train. 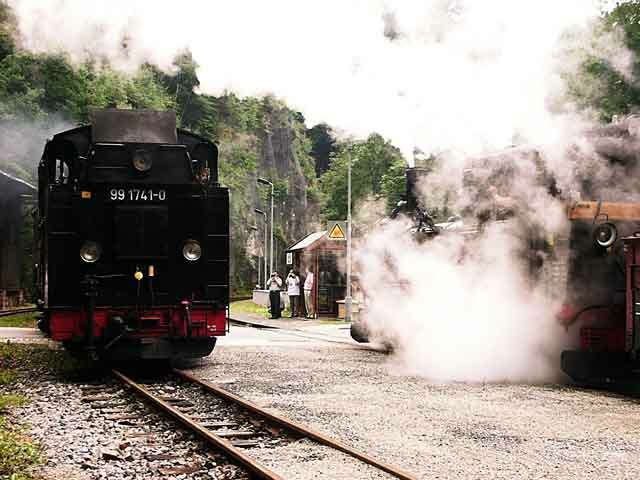 There is some doubt as to whether the line will survive now. 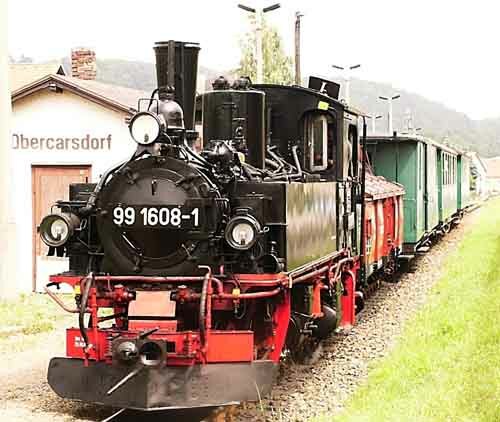 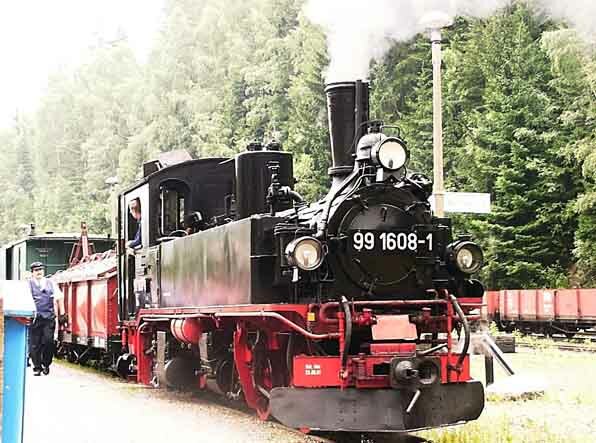 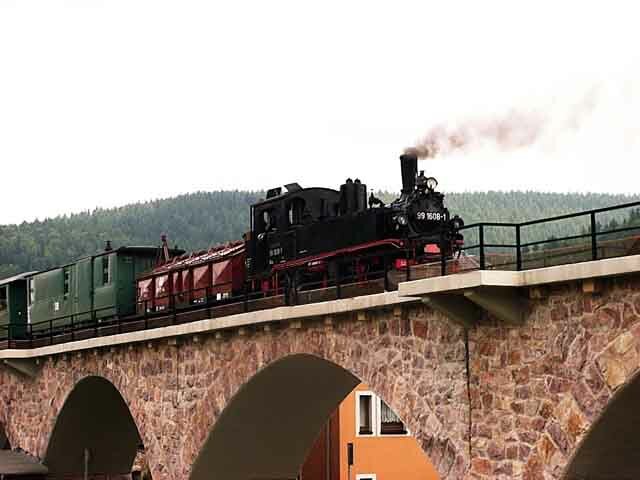 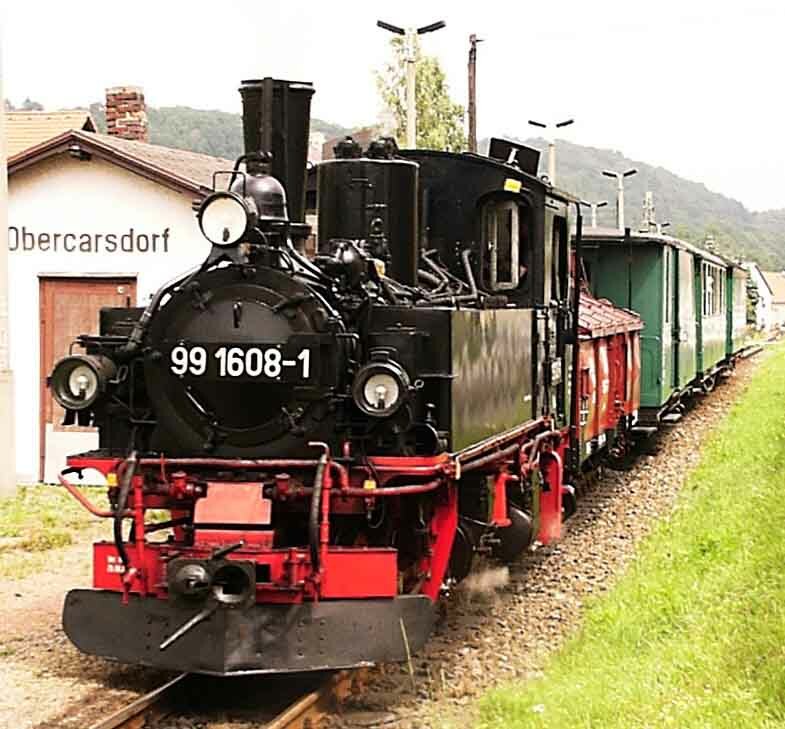 At Obercarsdorf we passed another Kurort Kipsdorf to Freital-Hainsberg train hauled by 99 1746-9. 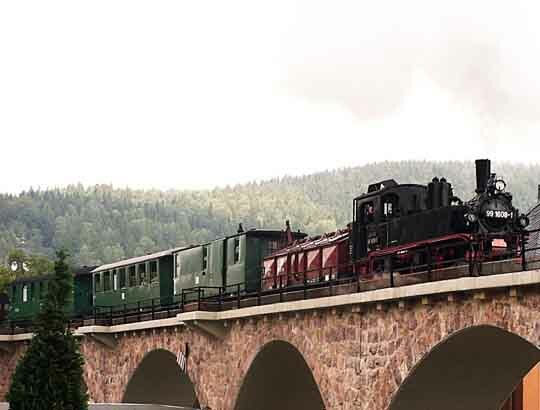 Just after leaving Obercarsdorf there was a runpast over a level crossing and later our train reversed and then ran forward again across Schmiedeberg viaduct. 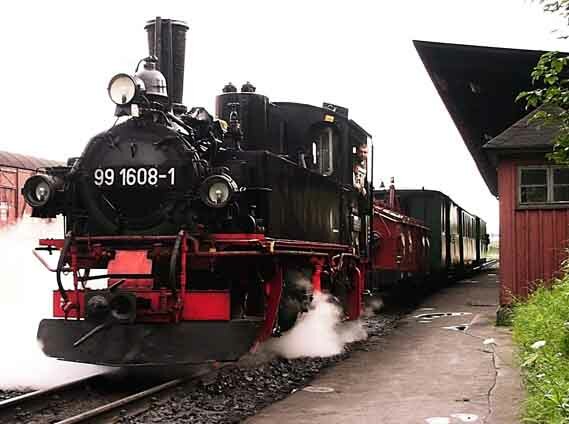 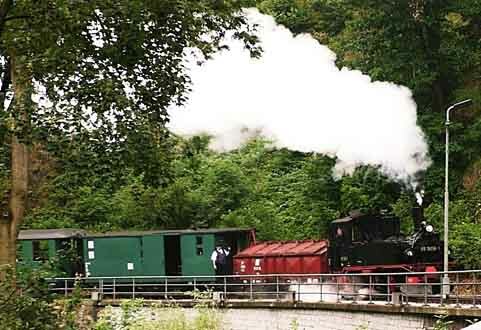 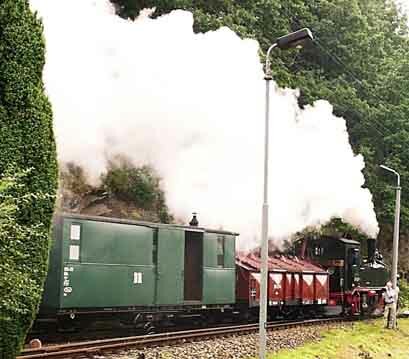 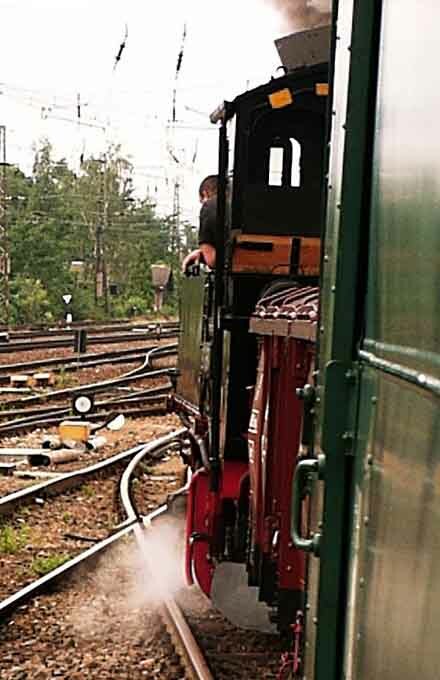 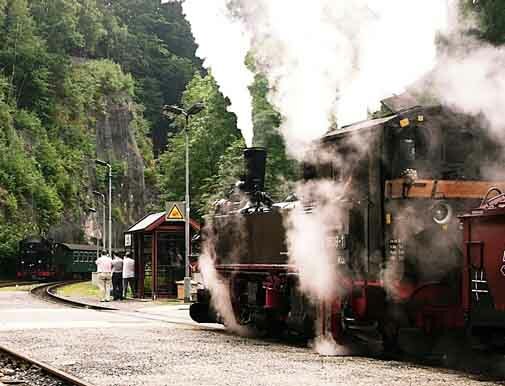 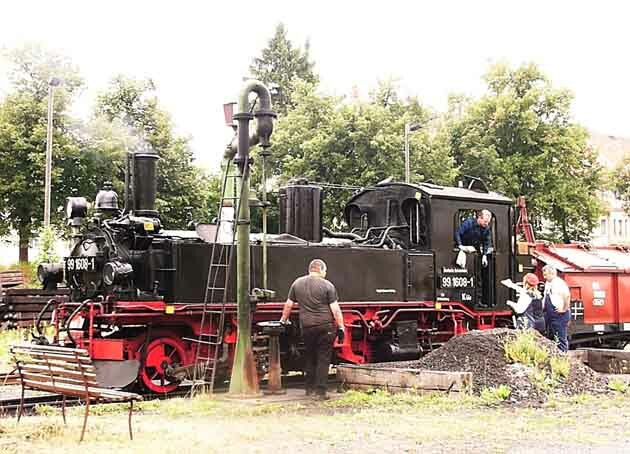 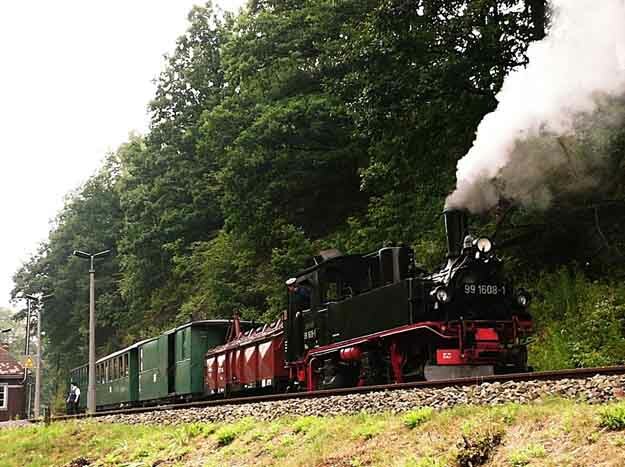 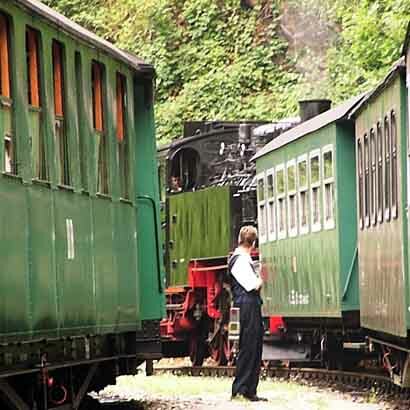 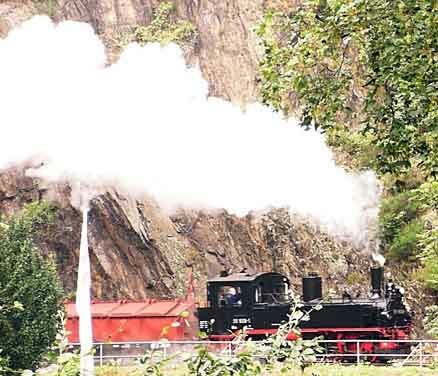 We arrived at Kurort Kipsdorf at about 12.20 and the Meyer uncoupled and moved round to the water column. 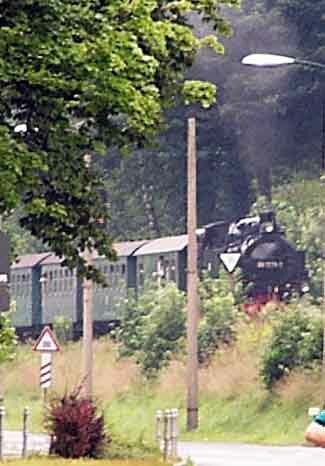 About 10 minutes later 99 1771-7 arrived with a train from Freital-Hainsberg. 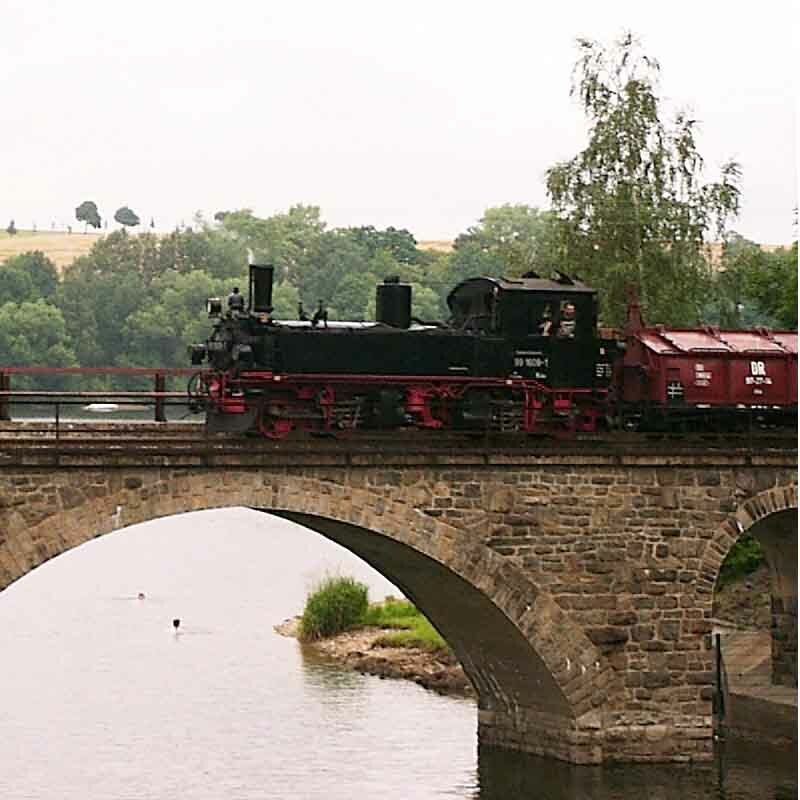 This page created 6th September 2002.